When you apply for any benefit to an organization, the most common formality is to submit Printable Applications, addressed to a certain person associated with the management of the company. These applications convey the message to the organization and establish a legal bond between the two parties. 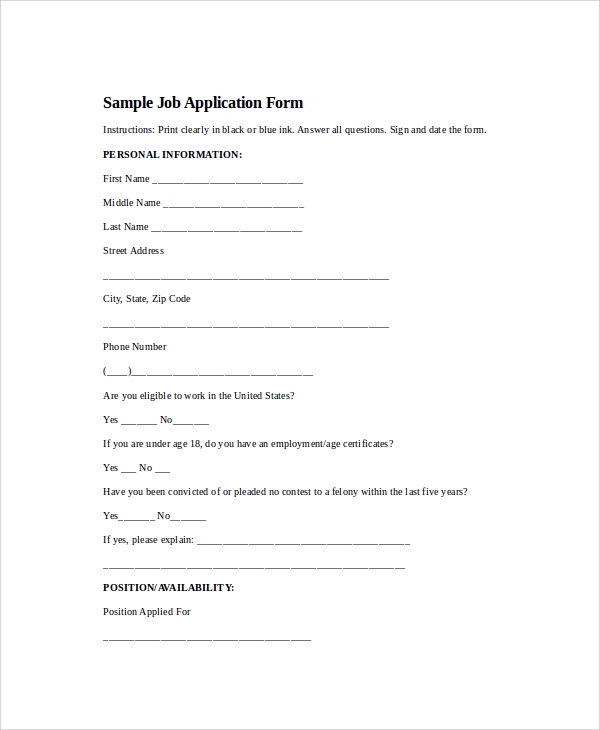 A Job Application Form contains all the details of the individual, including name, address, personal details and so on. From rental services to insurance, these forms offer various uses. Here are some samples for you to check out. 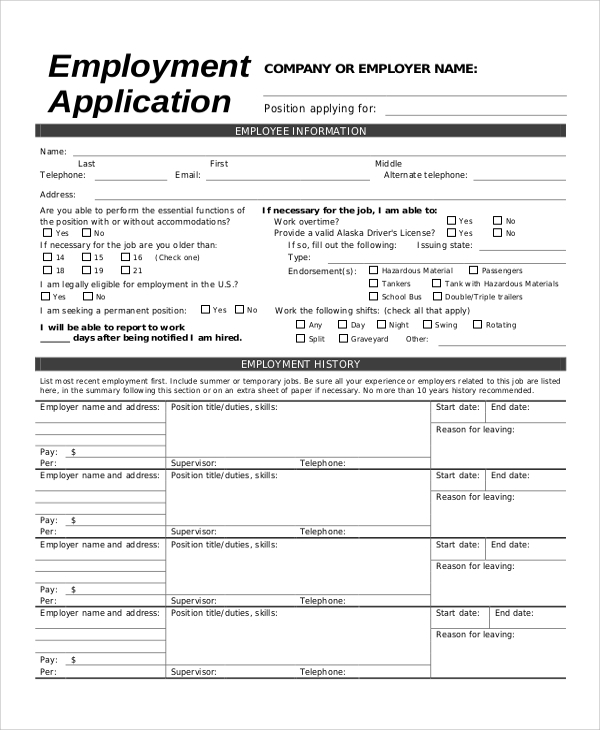 These application forms include the personal details and purpose of application in the beginning. It is followed by the legal information. There are various questions to be answered by the applicant here. People interested in volunteering for a particular cause need to fill up these forms. It includes the personal details, the cause of volunteering and the accessories and assistance required for the cause if any. 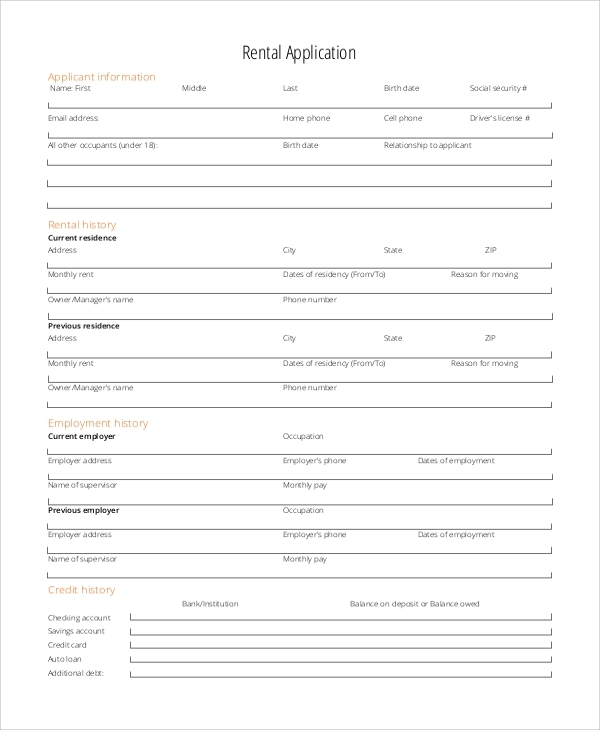 In Rental Application Forms include a detailed residential history of the applicants. It also includes the credit history and employment history of an individual. Other general information like bankruptcy is also included here. 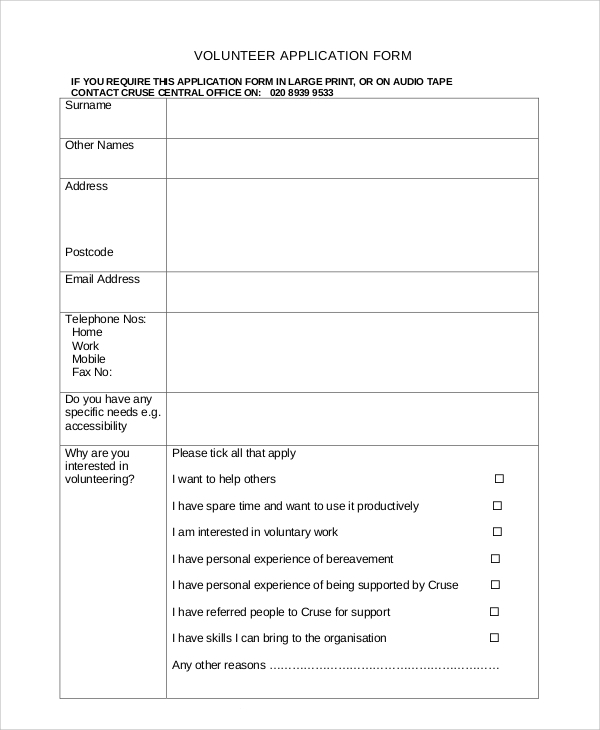 Why do you need a Printable Application Form? Application forms have multiple uses. For instance, when you apply for a job, you need Employment Applications and these need to be tailored according to the profile of the company. When you want medical services, you have to craft the form in lines with the directions prescribed by the organization. 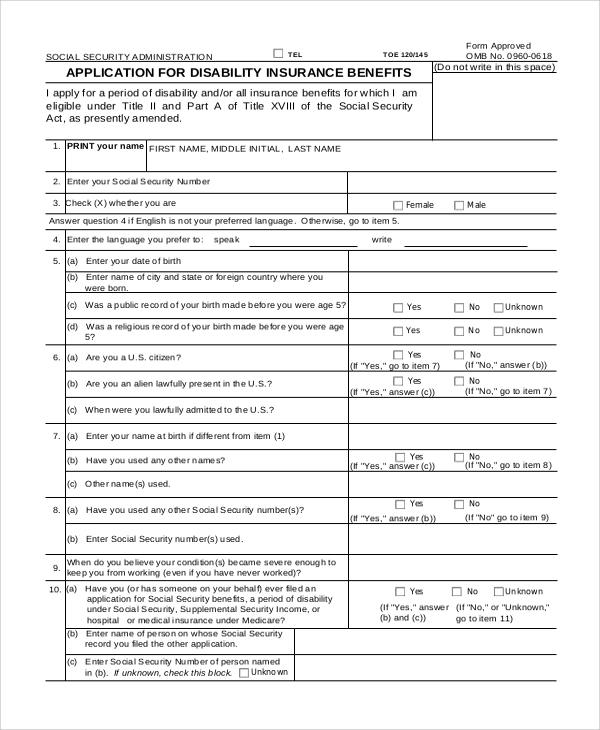 Other than these, there are other application forms like social security disability applications and college form applications. The aim of these forms is to enroll the names of the candidate officially. The purpose and needs of the applicants are included in the form in a pre-formatted way, prescribed by the organization. This application is filed from the job seeker to the recruiters with all the relevant details that the company needs. There are multiple choices of options to be ticked and some details to be filled up to yield the required information. 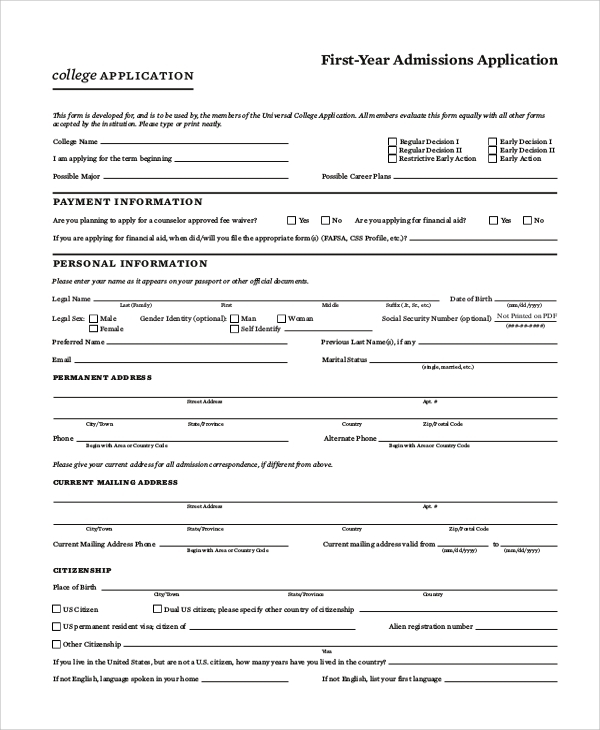 College application forms start with academic and personal reports in a pre-formatted style. It also includes the payment information, information on family income and other domestic data about the applicant. What Information Should be included in the Printable Forms? First of all, the forms contain personal details of the individuals applying for a particular purpose. These details are then customized according to the department or internal stratification of the organization. For instance, if you are applying for admission to a college, you need to fill up the department, standard, and other relevant details. The contact information of the individual is a must. In the case of a Job Application, you need to focus on your abilities and career. The cause of applying to the organization is to be clarified in the details provided. These forms have the tabular format in general, with multiple rows and columns. Application forms are formatted by the organizations, and there is a limited scope for individuals to design and customize them. 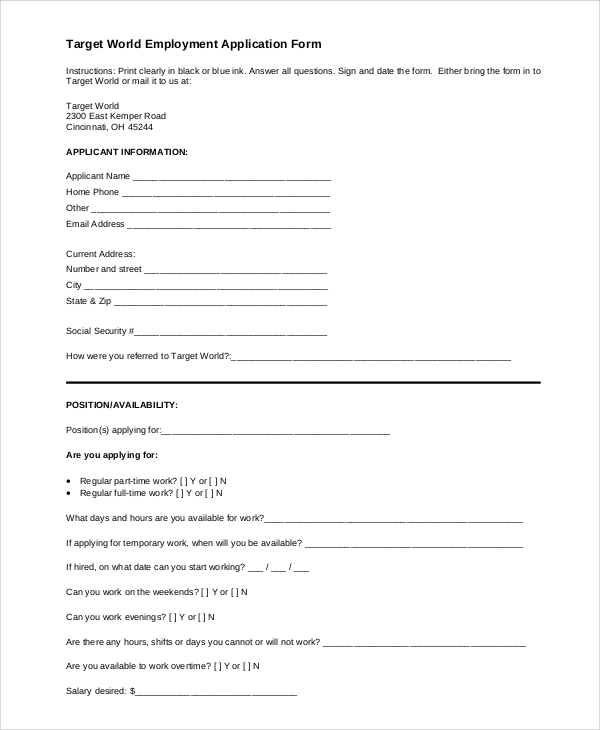 If you are looking for applicants for your organization, you can check out the Target Application Forms on the website. All possible varieties of application forms are free to be customized here.